Iowa State and Nebraska went to overtime Saturday. Iowa State fell one pass short of pulling of the upset and ending its final Big 12 Conference meeting with Nebraska on a winning note in 31-30 overtime loss in Ames. The Cyclones rallied from 14 points down in the fourth quarter to send it to overtime. 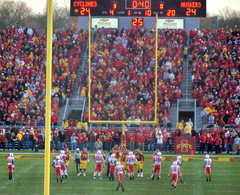 Coach Paul Rhoads called for a fake overtime to try and win the game with a two-point conversion instead of tying it with a kick. The receiver appeared to be open, but the pass was picked off. “They say it’s a game of inches, it exactly is that, “Rhoads said. He says his team played their hearts out after he asked them to give every ounce of energy and execute, and he says they did that for 60-plus minutes against a top ranked football team. Rhoads says they knew going in they might try a fake on a conversion. Rhoads says he made the decision, as they had studied it throughout the game and had it in the game plan coming in. He says the play was there as the receiver was open, but they were not able to execute. 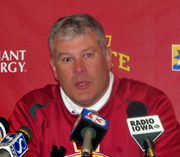 Rhoads said he had no second thoughts about going for the win. “No hesitation whatsoever, the play was there, we execute, game over, we’re the ones running into the endzone celebrating,” Rhoads says. Rhoads credited senior quarterback Austen Arnaud for bringing them back after they got behind by two scores. He says Arnaud is a tough player and competitor who in a lot of ways played his best game as a Cyclone. Rhoads says Arnaud was able to overcome two interceptions, one for returned for a touchdown, to bring the team back and get them to overtime and then a score in overtime. Alexander Robinson ran for 114 yards and caught the tying touchdown pass in the fourth quarter. He says the fake conversion should have worked. Robinson says it was a good call and was there, they just didn’t execute. Iowa State has been blown out in each of the other games where they played a top ten team, but Robinson says they were able to put things together this time. He says they prepared very well and were able to come back and execute against Nebraska. Iowa State fell to 3-3 in the Big 12 and 5-5 overall. They go on the road to face Colorado Saturday.